Black Texans are African Americans sampled in the state of Texas. Like other blacks in America, they usually also carry a high proportion of Caucasian or white ancestry and may additionally have American Indian. 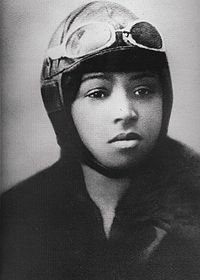 Bessie Coleman, the first African American female navigator, had a part-Cherokee father. Photo: Pioneer aviator Bessie Coleman was born in Texas and grew up in Indian Territory. Photo by National Air and Science Museum. Source publication: Allele Frequencies for Nine STR Loci in African-Americans, Chinese, Vietnamese, and Bangladesh Populations, JFS, 1999, p1316-1318.